This summer, we spent A LOT of time outside updating our home’s curb appeal. It’s such a nice feeling to finally drive up to our new and improved exterior. 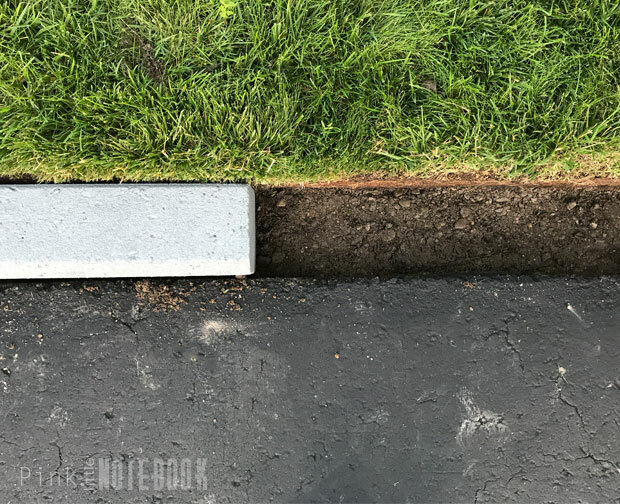 It did take us many evenings and weekends to complete all our projects but I think the most rewarding DIY of them all was this one—our driveway and curb renewal. The funny part about it all, I didn’t realize how bad our driveway looked until I started taking “before pictures” for my blog. I was so used to overlooking the driveway that it didn’t occur to me that maintenance was desperately needed. We ended up adding this project to the mix and the good news is you don’t have to spend a fortune hiring someone to do this, it can all be done on your own! 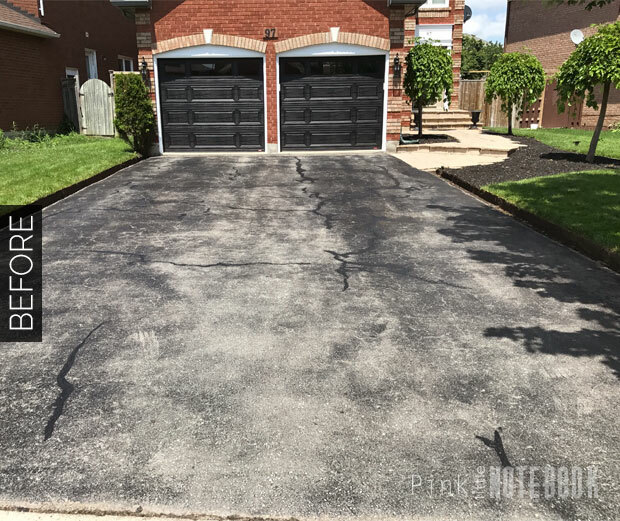 When it comes to our driveway, it’s old, it has a ton of cracks, the previous sealer is fading, and it’s lined with pink concrete curbs on either side. Something needs to be done! For starters, I learned that driveways need regular maintenance every few years to help extend the life of the asphalt. This consists of filling in the cracks and using a quality driveway sealer. 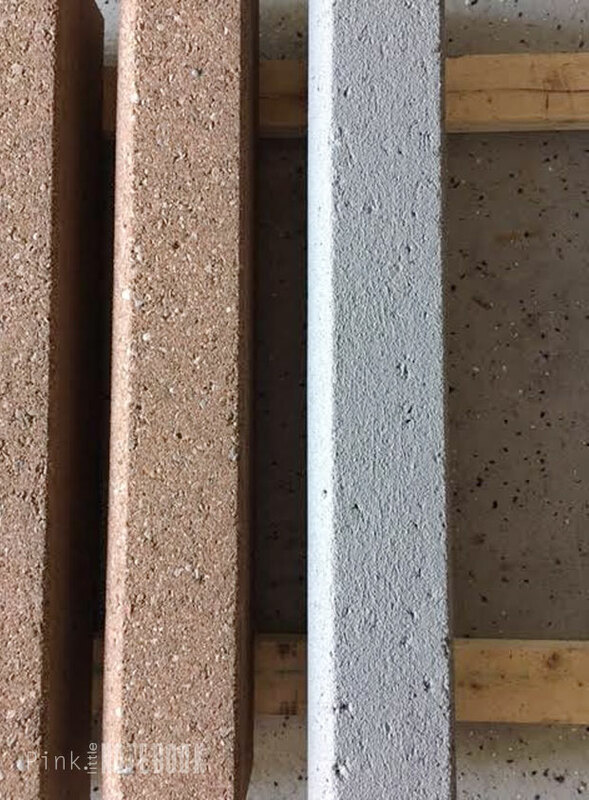 As for the curbs, I looked into purchasing new ones but after doing the math on $9 a sq. ft., I realized it wasn’t going to be a cheap fix just to change the colour I don’t like. So I thought some more and “concrete paint” popped into my head. The $1,000+ in materials I would of needed to purchase, is now just a $40 paint fix! 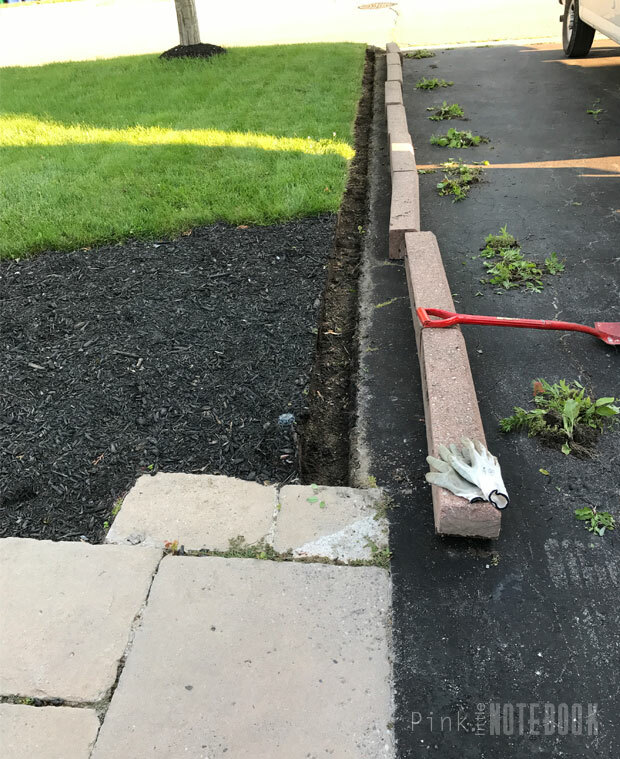 We began this project by removing our curbs, which is quite easy since they’re in 3 ft. sections. Now you could possibly keep you curbs in place and paint. However, since we had so much weed growth and we are sealing the driveway right after, it was just easier for us to take them out. Mike ended up moving them into the garage. At the time, there was rain in the forecast and we didn’t want to take the chance of down pour once we started painting. I used Rust-Oleum’s Deck & Concrete Restore 10x paint, which we had tinted to grey (to match the colour of our home’s eavesdrops). This is my first time using this product. I wasn’t sure how well it was going to stick to the concrete but this stuff worked like a charm! It had a thick coverage which soaked right into the concrete. After the paint dried, it still had the look and feel of aggregate. The best part—one coat and I was done. We waited for the rain to subside before we moved on to the driveway. 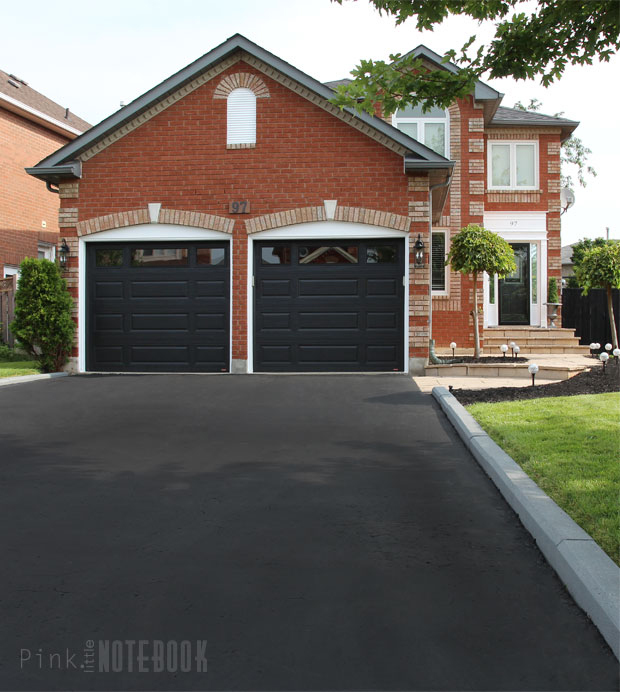 Getting a top-notch sealing job on your driveway isn’t difficult, and the results are really dependent on only two things: quality materials and proper preparation. We started off by using a leaf blower to make sure the driveway was free from dust, debris, vegetation, or anything that will keep the repair materials and sealer from adhering to the asphalt. 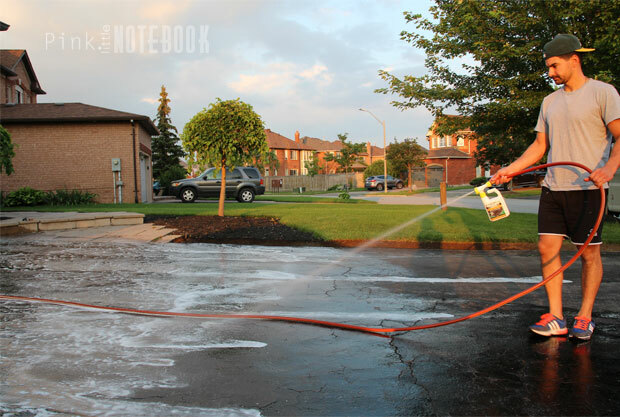 We thoroughly cleaned the driveway using EpoxyShield Premium Multi-Purpose Cleaner. The bottle attaches right onto your garden hose which makes for a quick and easy application. Mike started from the top of the driveway and worked down. Once everything was covered, he scrubbed the cleaner right into the surface using a large push broom. We rinsed the driveway and waited for it to completely dry before moving on. Next I repaired the cracks using EpoxyShield Premium Rubberized Crack Filler. 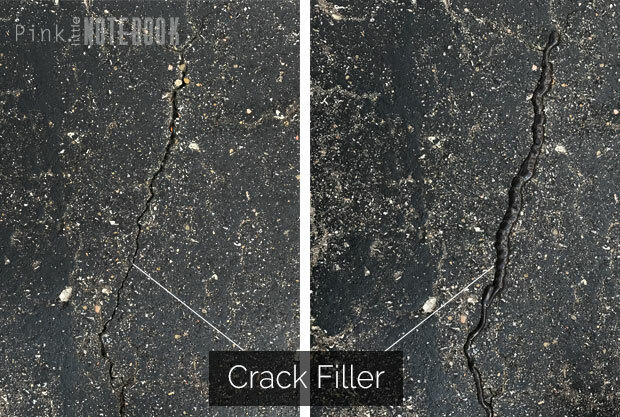 This product is great for cracks 1/2″ or less. You apply it right from the bottle into the crack and then smooth it out. 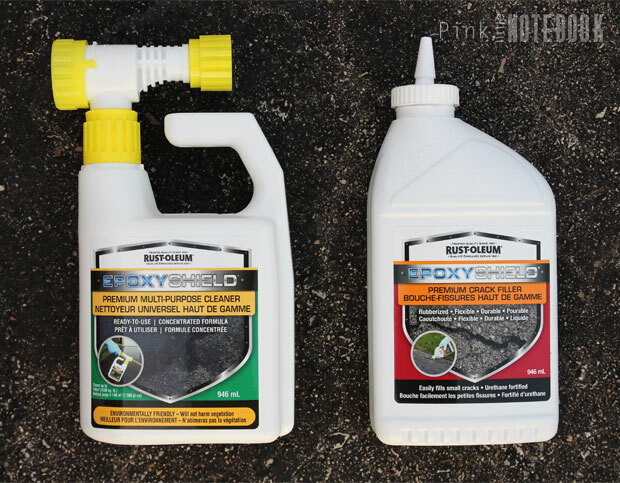 If you have any larger cracks or holes, it’s probably best to use something such as the EpoxyShield 2-in-1 Asphalt Patch & Crack Filler. Again you want to let it cure completely before moving on. In the meantime, I taped up all the edges where the driveway meets our pathway and the garage floor. Then using a paint brush, I cut all the edges using EpoxyShield Driveway Sealer Plus 3X. By the way, being curb-less saved us so much time from excessive tapping and cutting. 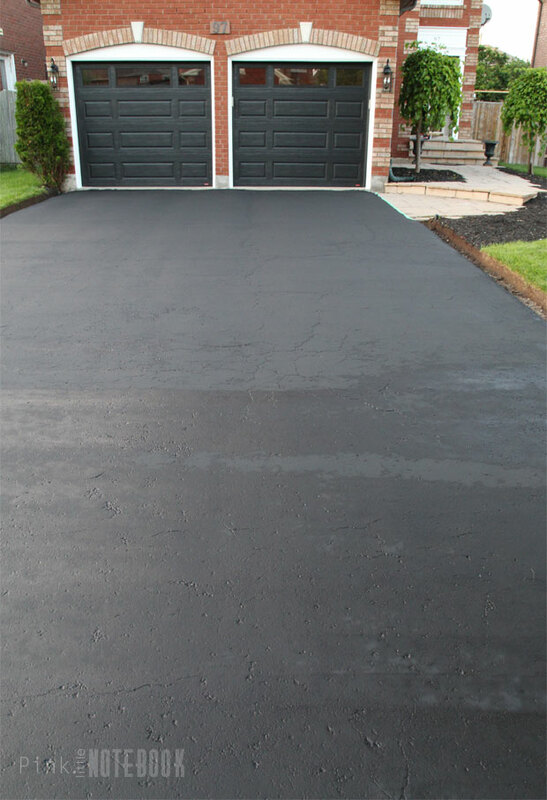 To seal the rest of the asphalt, we poured a line of sealant along the width of the driveway starting from the top. 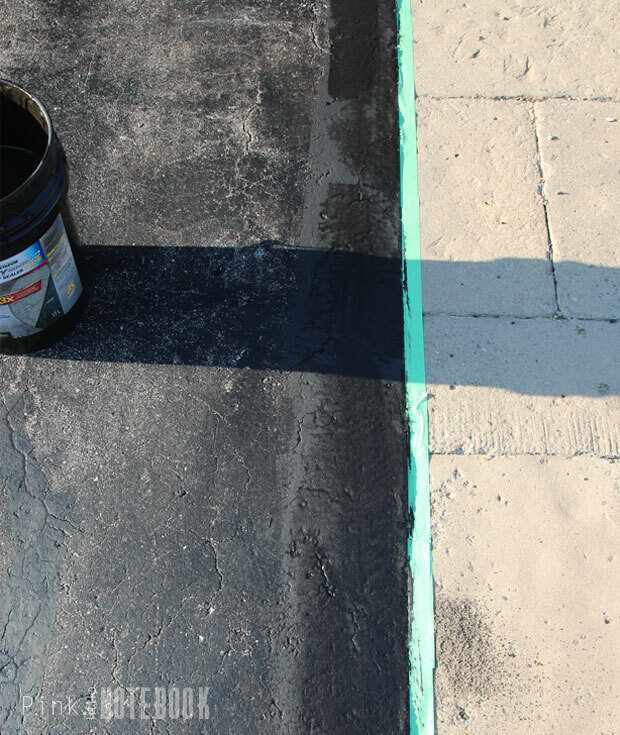 Using a roller (or a squeegee), pull and compress the sealant on a 45-degree angle. It takes a bit of playing around at first to get the hang of applying the right pressure. However, once you figure it out, it’s a breeze to apply to the rest of the driveway. One coat is all that is necessary. Also another big thing that I want to point out is that the colour of this product is jet black! It has the “just paved” look to it. You could see the amazing results immediately. By the time we got to the bottom of the driveway, the top was already drying. Of course, using this sealant on an old driveway won’t remove all the surface damage but it does one heck of a job disguising it. 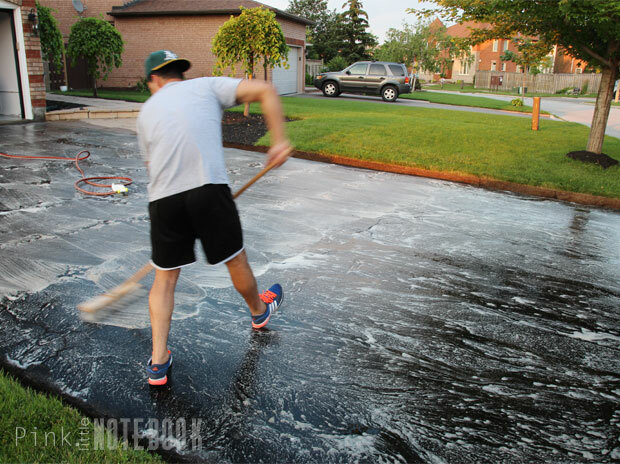 We let the driveway cure for 24 hours before we walked or drove on it (even though the product says ready in four hours). The curbs were put back in place the next day. We’re loving this new look. 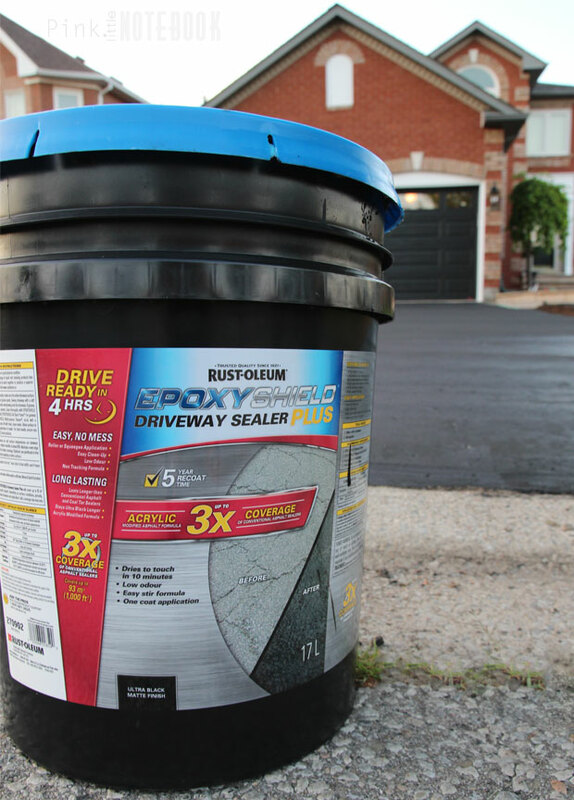 Please share you experience using driveway sealant or concrete paint. *Click through these links to see more about our exterior makeover: Updating our Curb Appeal, How to Repair your Crumbling Concrete Wall, Our new Garage Doors, Fixing a Walkway with Sinking Stones, Reviving our Exterior Front Entrance, Exterior Update, Five Ways to Upgrade your Front Door, Exterior Makeover: Before & After. 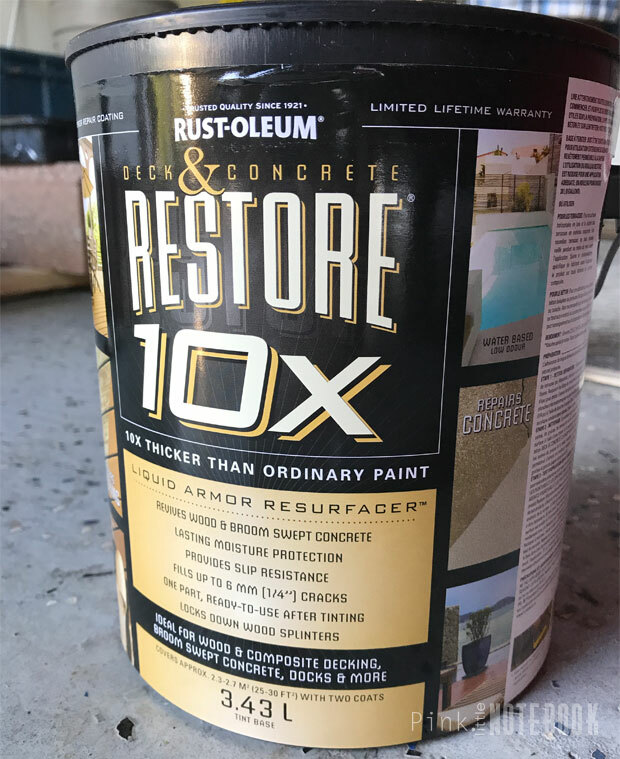 Disclosure: I am thrilled to collaborate with Rust-Oleum in our outdoor project. The views and opinions expressed in this post are 100% my own and based on my experience using this product. Gasp! What a difference the color-change made! I personally think it looked better with the black garage doors against the red bricks! I agree, it’s such a refreshing look. Thanks for stopping by! Wow, you guys did a fantastic job! You have a beautiful home as well. Also, I didn’t realize that asphalt driveways needed maintenance, or even that you could maintenance them. You learn something new every day! This looks amazing! 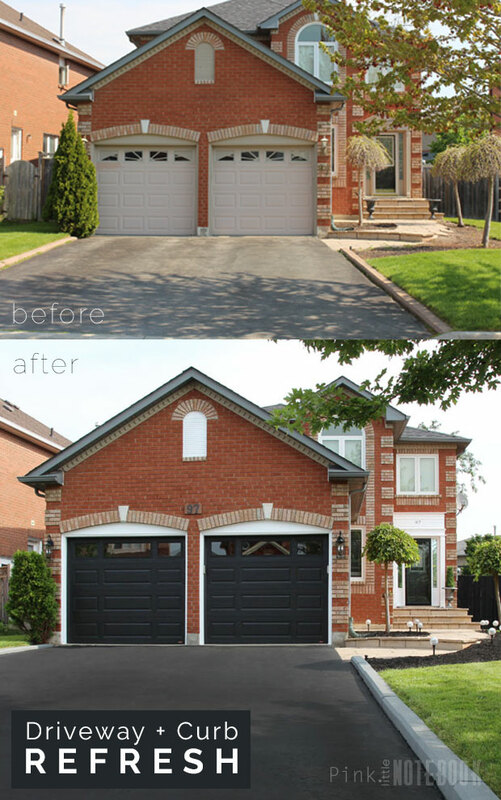 I love the changes you made to the house as well – the black garage doors really pop! Thanks Shannon! It’s a drastic change but we love it! Holy moly! This looks amazing! What a great DIY project, congrats! Awe thanks so much Kasia! Sabrina this is great! It is such a lovely article and I find that the photos are lovely as well. It’s just amazing how you put all these together on “How to Renew your dated Curbs & Driveway” with such great tips! Looking forward to more of these. Wow! What a difference! Look fantastic.